Nairobi (Agenzia Fides) – AIDS is a forgotten epidemic that in south east Africa kills 380,000 people every year. The virus in that area alone is contracted by over 2,000 more people every day. The HIV agent responsible for AIDS is still present for almost 20 million Africans living in the south eastern part of the continent with 800,000 cases of contagion in 2017 alone. In the face of this emergency, "in more than 30 years much has been achieved, but still not enough, to consider AIDS a thing of the past, means lowering our guard in the struggle against HIV and thwarts encouraging signals of recent years. It is necessary to guarantee a cure for everyone: in Africa as in the North of the world", the Sant’Egidio community affirms on occasion of the World Day against AIDS , 1st December. 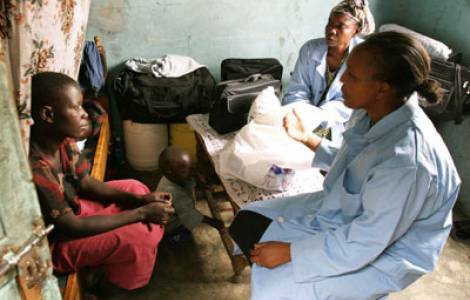 Since 2002 Sant’Egidio has been active with its DREAM programme in 11 African countries, proving free antiretroviral therapy to 500,000 patients. According to a report sent to Fides the DREAM project launched to fight AIDS in Africa, has helped 100,000 babies of HIV positive mothers to be born free of the HIV virus. The project works in 47 clinics and 25 molecular biology laboratories in Mozambique, Malawi, Tanzania, Kenya, Republic of Guinea, Swaziland, Cameroon, Democratic Republic of Congo, Central African Republic, Angola and Nigeria. In these years, millions have befitted from the free DREAM project which has provided training for thousands of Africa specialists and continues to work on health education, feeding programmes, early diagnosis, fighting malaria, tuberculosis, chronic diseases, prevention and treatment of tumours and above all malnutrition. "The DREAM project- the Community informs us – is the demonstration that AIDS can be defeated, we have the means to put an end to a global threat which has lasted too long, but we need help from all sides. We cannot stop here, after 30 years of commitment putting successes already obtained at risk.